Why the mail app takes a lot of space although there is no mails? Simply look at this. Mail consumes 2.5 GB. Why? I removed all messages, readded gmail account. Anything else? The Apple Mail app likes to keep cache and data from your emails available offline. That is very helpful for viewing emails and their digital content when you dont have a strong signal, or have access to wifi. Delete the mail account off of the iPhone. Then restart the iPhone and then re-add that email back to the iPhone. Use the Gmail app for iPhone. The gmail app will keep the email size much lower than whats on your iPhone. The most I've seen the gmail app do for me is 400MB. Thats definitely a huge saving in contrast to 2.5GB. Limit the amount of email that Gmail can allow the Apple Mail app to have access to. You will have to use the desktop to access this setting in gmail. You can log onto gmail.com, open the Settings page, click “Forwarding and POP/IMAP,” and activate the “Limit IMAP folders to contain no more than this many messages” option. Set it to lets say “1000” and the Mail app won’t be able to download more than the 1000 emails from your account. If you use multiple folders, then that 1000 emails applies to each folder. These three should give you some options to test out and free up some of your storage that the Mail app is eating up. Not the answer you're looking for? 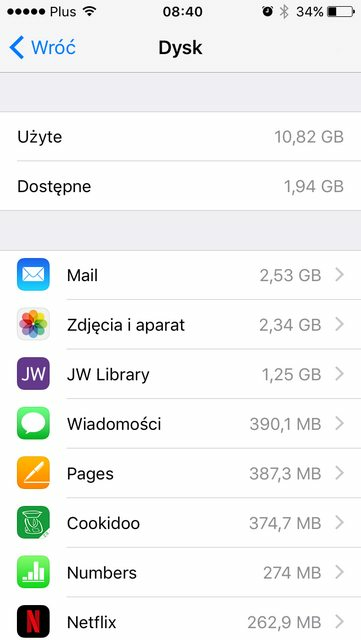 Browse other questions tagged ios email disk-space . How can I configure the iPhone to send/receive mail through Gmail, but using a different e-mail address? When using Mail with Gmail IMAP, how to move emails to different folders and not label them? Mail marked all my inbox items as read. How do I undo this?